While we get why people drift to Gryffindor with it's three Voldermort fighting heroes, we think that Hufflepuff doesn't get enough credit. First of all, how great is Cedric Diggory? He becomes the Hogwarts champ only to have to share the honored position with young Harry. Does he get mad? No, because Hufflepuffs are a humble people. He ends up helping Harry along during the hardest challenges. That's just the kind of spirit this house has. Plus, they have access to the kitchens. Those are the kind of friends that you want to have around on the chilly nights of finals week. This robe has a nice flow and long, wide sleeves. The black material is trimmed with gold material along the sleeves, the inner split, and in the hood. The sweater is trimmed with a matching gold along the bottom and is matched to the gold and black tie. 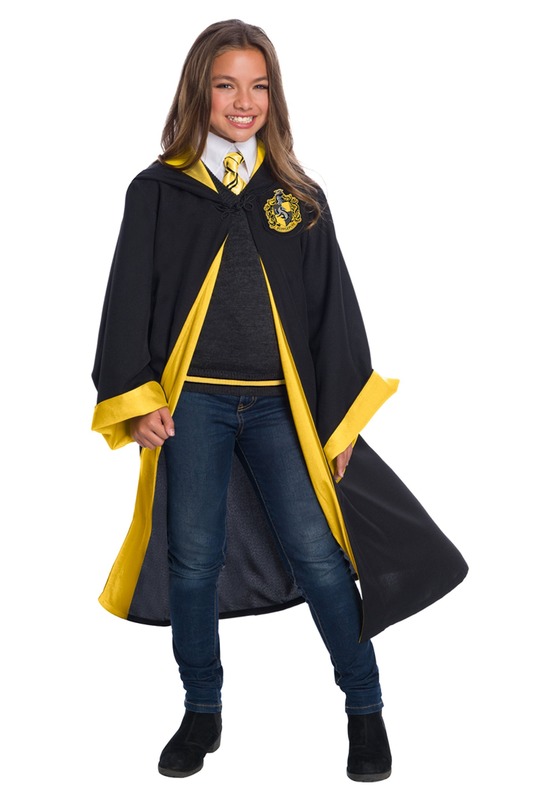 The robe is also enhanced with a knot that secures the robe closed and the Hufflepuff shield with a Badger under a knight's helmet and scrolling around the shield. 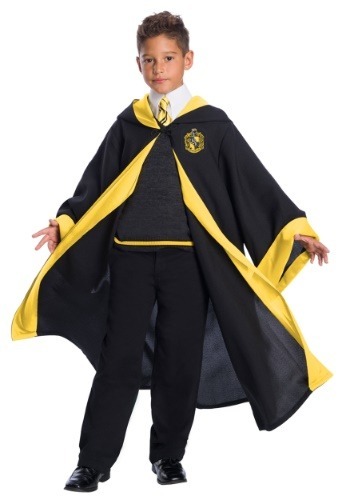 If your child is ready to get sorted into Hufflepuff then they are probably pretty chill witches and wizards. Hufflepuffs tend to have more fun at Hogwarts. They get the coziest common room that's guarded with a barrel of vinegar that will burst if anyone tries to break in. Hufflepuff classmates get to discover all sorts of weird plants provided by good old Pomona Sprout. Life as a Hufflepuff might not have the bad wrap of Slytherin or the glory of Gryffindor but there's no better house to be in when it comes to becoming a good and talented wizard. After all, Merlin came from this house. And since the kids from Hufflepuff hate to brag, we'll have to brag for them!